Did you know that nationwide, 38% of fourth graders are below grade level in reading skills? In fact, according the National Education Association’ s article, Facts About Children’s Literacy, on top of that, only 7% of fourth graders are advanced in reading skills. As teachers, you know teaching reading is one of the most challenging jobs on your list of things to do. Even once you have “readers” in your classroom, your students need to develop comprehension skills in order to advance reading levels. One way to help readers with comprehension is to practice close reading. Close reading is a strategy where students read, then reread a text in order to improve comprehension. Students analyze by looking for patterns, repetition, author’s craft, or key vocabulary in their texts. The goal of close reading is for students to be able to deeply understand their text and be able to explain what they have read to someone else. Close reading is an imperative skill tightly woven into the Common Core State Standards across grade levels. Make it fun! Provide students with highlighters, scented markers, highlighter tape, sticky notes and more to mark up their reading passages. A key component of close reading is to highlight, mark, or underline important parts of the text. 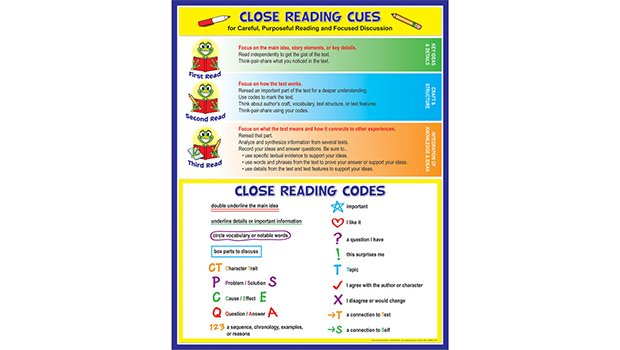 Try this Close Reading Cards and Conversation Kit! This kit has all the prep work and guess work taken care of for you. No need to search for appropriate text or stress while trying to think of challenging text based questions in the middle of a lesson… it is all right here! Your students will love the interesting topics, whether it is small group, or whole class. Grade 3, 4, 5 options available. Teachers remember: teaching close reading can seem like a daunting task, but using strategies and resources like these can help! Try out these tips for teaching close reading in your classroom today. Do you have other tips for teaching close reading?